Outdoor shuffleboard descends from an 18th-century table game called shovelboard. Rules for outdoor shuffleboard are set by the U.S. National Shuffleboard Association. You use a long-handled cue to shove 6-inch discs along a 52-foot-long by 6-foot-wide court. Each end of the court has identical markings dividing it into a shooting area, "Off" area, and five scoring areas with values ranging from 7 to 10 points. The objective is to place your discs in a scoring area at the far end of the court and/or knock your opponent's discs out. Begin play standing in the shooting area at one end of the shuffleboard court. The shooting area takes up the first 6 1/2 feet of the court. Just beyond the shooting area is the 10 Off zone. Place one of your discs in the 10 Off area. Use your cue to push the disc so that it slides down the court toward the scoring areas at the other end. You must remain in the shooting area while you make your shot. Alternate taking shots with your opponent. Each of you has four discs which are traditionally colored yellow for one player and black for the other. The first round of play in outdoor shuffleboard, called an end, continues until each side has shot all four discs. Add up the points you scored in the first end of play. Only discs that are completely inside a scoring area count for points. During play, you may manage to knock one or more of your opponent's discs into or out of a scoring area with your shots. This does not affect the scoring because only the final position of the discs counts. 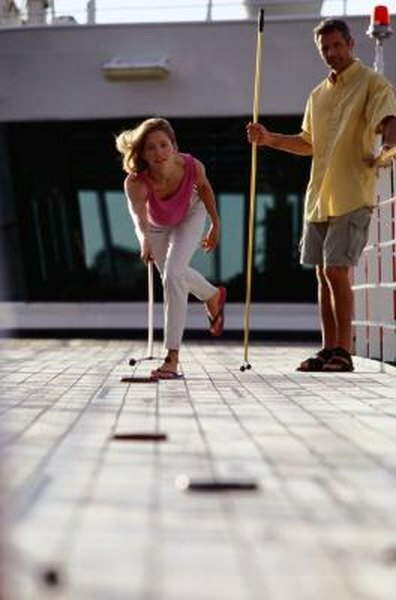 Two-person teams can play outdoor shuffleboard as well as single players. The rules for doubles are the same as for singles shuffleboard. The players on each side alternate shots so that each player shoots two discs during each end. Avoid penalties by ensuring you don't touch or cross the baseline when taking a shot.